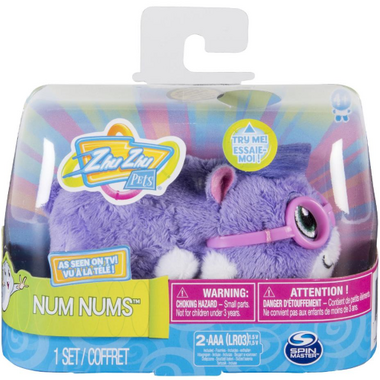 Zhu Zhu Pets Hamster Num Nums is the heart of the Zhu Zhu gang. 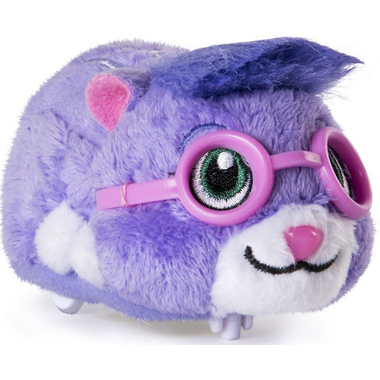 The heart-shaped birthmark on her purple fur is a small symbol for the big heart inside this sweet Hamster. Num Nums is Pipsqueak's right hand (or right paw) Hamster. She's always ready to help out her best friend Pipsqueak. Hear this interactive hamster make adorable noises by pressing the button at the back of her neck. Is Pipsqueak in trouble? Press the button on her lower back and Num Nums will spring into action, whizzing, whooshing and spinning around your home. The sensor in her nose helps Num Nums safely navigate any space.